To some, Bush's descent from heaven aboard an S-3B Viking jet symbolized his prowess as a war leader, while for others it was a reminder of his missing year of military service while hiding out from the Vietnam War in the Texas Air National Guard, his spot secured by "Poppy's" political connections. But if the symbolism of his aircraft carrier photo-op was ambiguous, the choice of venues for the May 2 speech boosting his tax cut proposal was not. Three years ago Bush was busy raising money in Silicon Valley. Late in the 2000 campaign he used a $1,000-a-plate fundraising dinner in Atherton to criticize a Gore tax cut proposal. 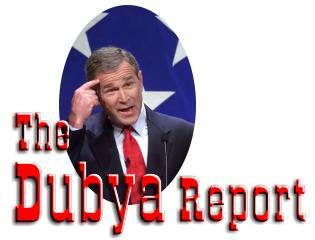 "If you're going to have tax relief, everybody who pays taxes ought to get tax relief," Bush said. "Yet he's willing to talk about the rich and the powerful; He said I'll represent the powerful." This time, though, Silicon Valley executives were not invited to the Bush event. Instead he used as a backdrop the grounds of United Defense Industries, maker of the Bradley fighting vehicle, in what observers described as an attempt to link perceptions of his economic plan with national defense. There's a reason Bush's handlers would not have wanted to use Silicon Valley as the platform from which to promote their economic plan. When Bush took office, unemployment in the southern end of Silicon Valley was 1.7 percent, among the lowest in the nation for metropolitan areas. In February 2003 unemployment reached 8.5 percent, and may now be as high as 10 percent. Bush calls his tax cut proposal a "growth and jobs" plan. Referring in his May 2 speech to the recently published 6 percent national unemployment number, Bush said, "That 6 percent number should say loud and clear to both political parties in the United States Congress we need robust tax relief so people can find work." Silicon Valley residents have not been taken in by the rhetoric, though, it seems. An editorial in the San Jose Mercury News published on the day of Bush's visit stated bluntly "... let us tell you what we don't want: a tax cut. While many in the Valley would benefit because of our generally high tax brackets, we think the money can be put to better use, like covering war costs and revenue shortfalls caused by the recession." Other suggestions from the Mercury News's editorial writers included extending unemployment benefits, returning money to the states, and increased funding for health care and education. What the Mercury News editorial does not point out, and which has received little coverage in the mainstream media, is that by the administration's own estimates, the tax cut will actually reduce job growth after 2004. According to the Council of Economic Advisers publication Strengthening the American Economy, the impact of the tax cut proposal on employment growth would be increase an increase of 1,090,000 jobs by the end of 2004, but a reduction of 240,000 from 2005 through 2007. Source: "Strengthening America’s Economy," Council of Economic Advisers, February 4, 2003. In the short term, the plan would have only a modest impact because it is not targeted to boosting demand for goods and services; in the long term, any positive effects would be offset by the expansion in the budget deficit and associated reduction in national saving. Orszag and others have suggested that the main economic problem in the short term is that factories and businesses aren't able to use the full capacity they have to product goods and services. The measure of this activity is called the capacity utilization rate, which is the ratio of actual to potential production. In December 2002 the Federal Reserve Board reported a 75.4 percent utilization, well below the 30-year average of 81.5 percent. But the administration's tax cut is unlikely to improve capacity utilization, because it does not target middle-class and lower-income families, who would be more likely than wealthy individuals to spend any tax savings. Unless an increase in the budget deficit is entirely offset by an increase in private saving, it must produce either a reduction in domestic investment or an increase in borrowing from abroad. All else equal, it must therefore reduce the capital stock owned by Americans and reduce future income. The NBER abstract of Auerbach's study concurs, saying that "... the Bush tax cut may increase saving in the short run, depending on assumptions.... But they are not large enough to offset the negative impact of tax cuts on national saving. In the longer run, saving and output are likely to fall." On April 30, 2003, Federal Reserve Chairman Alan Greenspan stated a similar position, saying that with a large deficit, "you will be significantly undercutting the benefits that would be achieved from the tax cuts." Greenspan's remarks came as the Treasury department announced that tax revenues were arriving at a lower than expected rate. Taking into account lower revenues and increased spending passed earlier in 2003, government and private analysts predicted that the budget deficit for the current fiscal year would be at least $80 billion higher than the $287 billion the Congressional Budget Office predicted in March 2003. Source: "The Administration’s Economic 'Stimulus' Proposals," testimony of Peter R. Orszag before the Democratic Policy Committee. AMT amounts are House Budget committee Democratic staff estimates. Total does not include Medicare prescription drug benefit, discretionary spending adjustment, Social Security reform, or other possible costs. The administration claims that the cuts could be paid for by limiting non-defense government spending. While technically possible, offsetting these costs would require a 40 percent reduction in spending over the years 2003-2013 compared to the Congressional Budget Office baseline, which itself is widely regarded as representing an unrealistically low estimate. The unlikelihood of this level of spending reduction can be seen by looking at non-defense discretionary government spending as a percentage of the gross domestic product (GDP). From 1962 to 2001, non-defense discretionary spending averaged 3.94 percent of GDP. In 2003 non-defense discretionary spending was 3.5 percent of GDP. Covering the costs shown above would require reducing this percentage to 1.7. We've reported elsewhere in The Dubya Report on the inequitable distribution of the administration's tax cut proposal. But it is the proposed elimination of the tax on dividends that has perhaps generated the most controversy. addition, earnings that were already taxed at the corporate level and that were retained by the corporation would generate a basis adjustment for shareholders. Such a basis adjustment means that, when the stock is ultimately sold, the increase in stock price due to retained earnings taxed at the corporate level would not generate a capital gains tax liability at the individual level. One problem with this proposal is that much corporate income is not taxed at the corporate level because of various tax breaks for business. Moreover, at least half of the dividends paid to individuals are not taxed because they are owned by employee pension plans, or nonprofit organizations. Peter Orszag argues that "non-taxation or preferred taxation of corporate income is arguably at least as big of a concern as double taxation." In effect, Orszag suggests, the proposal perpetuates current incentives to shelter corporate income, and retain earnings. The Bush proposals have not been immune from criticism by businesspeople, either. High-tech companies have complained that the Bush plan pressures them into paying dividends rather than re-investing profits to grow their businesses. These businesses also oppose the premise that shareholders would receive a dividend or capital-gains tax break only if companies have paid corporate taxes. The effect could be to limit the effect of current tax credit programs in reducing liability on the corporation's balance sheet, creating the appearance of a poorer financial position. Mortgage companies are concerned that the dividend tax plan will undermine the use of tax credits used to finance housing for the poor. Stuart Boesky, president of Charter Municipal Mortgage Acceptance Co. told Business Week that the plan would "reduce the amount of new affordable housing that will be built in America." Meanwhile, corporate lobbyists are looking to take advantage of the delay in finalizing legislation to promote their own special interests. Telecom companies want tax breaks for new investment; manufacturing companies want rate reductions; others seek a repeal of the corporate minimum tax. Would You Believe $550 Billion? By March 2003 when the congressional Joint Taxation Committee measured the cost of the Bush tax cut, it had grown from $674 billion to $726 billion. Yet some observers had speculated from early in 2003 that the size of the proposal was a tactical ploy, and that Bush expected Congress to limit it. If so, then he got what he expected, as moderate Republicans in the Senate joined Democrats in capping the tax cuts at $350 billion. White House aides blamed Finance Committee chair Senator Chuck Grassley and new Senate Majority Leader Bill Frist, calling Grassley a headline hound and claiming Frist was the victim of his own inexperience. When the House passed a budget that capped tax cuts at $550 billion, Bush eventually endorsed it. But analysis by the Center on Budget and Policy priorities shows that a plan put forward by Rep. Bill Thomas that proponents claim fits within the $550 billion is even more skewed toward the wealthy than the original Bush plan, and fits in the $550 billion limit "only by using gimmicks that cloak its true cost." Note: The numbers listed above for dividend benefit under the Thomas plan include the plan's capital gain benefit. The Thomas plan also extends a major business tax break that was passed as a part of the March 2002 stimulus legislation. Called "bonus depreciation" this provision currently allows businesses to deduct 30 percent of the cost of new investments in equipment and facilities. Critics have charged that the provision won't help stimulate the economy, if one believes that under-utilized capacity is the key short-term problem. But the Thomas plan extends the bonus depreciation provision through June 2005. The CBO has warned that extending bonus depreciation reduces its impact in stimulating the economy now. CBPP suggests that extending the provision may result in fewer jobs being created than if it were allowed to expire in 2004. Some observers have suggested that Bush stands to gain as much politically from losing a tax cut vote as from winning it. If he loses, so this argument goes, he can blame the Democrats for the troubled economy. There is evidence, though that the public is seeing through the administration rhetoric. A Harris poll reported on May 4, 2003 found that more Americans thought a tax cut would create deficits and damage the economy than believed it would promote growth. 77 percent of those surveyed said that government programs like Social Security and Medicare was more important than cutting taxes. In a series of interviews conducted over a period of months Salon.com's Patrick Arden found few residents of Peoria, Illinois who believed the Bush tax cut was really a jobs program. Many told Arden they thought it favored the wealthy. Asked for his opinion, unemployed laborer Robert Wood responded, "I don't know. All I'm asking for is a job. But no one's hiring -- everyone's worried." Ida Crall, 61, said "I guess I'm a fatalist. They say the future jobs are at the medical centers; then you look and see those jobs are paying $8 an hour. When you have most of your people making $8 an hour, often with no benefits, no health insurance, who's going to go to the malls anymore?" Local AFL-CIO employee Steve Capitelli says that despite being a strong labor town, Peoria historically favored Republicans. More recently, however, "Peoria County and the city have been going heavily Democratic -- the majority of officeholders are Democrats." As for the war in Iraq, "most of the labor folks I've talked to have some very serious questions about the wisdom of it," Capitelli says. Personally I think it's a huge waste of our resources. And for the first time in our history, we're an aggressor nation. Yes, Saddam is a bad guy, but who appointed us God to go after the bad guys? When does that end? The administration has never answered the most basic question: Why now? After keeping Saddam in a box for 12 years, why now? We couldn't get Osama bin Laden, so we're going after Saddam? Now that we're doing it, I want it to be successful, but I think it was a mistake. Bush will spend $75 billion as a first installment, and he still wants to give his friends tax breaks. The irony is the veterans will return home to find their benefits cut back. I'm just very suspicious of the administration's motives. There's another agenda Bush and his friends have got, and it's not a good one. Eliminating federal taxation of private capital, and dismantling the progressive income tax. Phasing out the pension-fund retirement system as we know it, starting with Social Security, and converting to individualized accounts. Eliminating the federal government's role in housing, healthcare, and other social services, first by shifting program management to local and state governments or private operators, then gradually cutting all federal funding. Funneling public money to churches to help them gain more influence in cultural life. Destroying organized labor. As Greider says, "Above all, the labor movement embodies the progressives' instrument of power: collective action." While Bush would never acknowledge the reactionary objectives of the right wing of his party, activists have been espousing these goals for years; some of their ideas are now law. And while ideology provides one unifying factor, the real impetus is provided by money. Bush's "lifetime" savings accounts create a new product line for the securities industry. The administration is promoting this initiative with the assistance of Fortune 500 companies who have included publicity materials in their letters to shareholders. The Bush healthcare plan rewards HMOs and the pharmaceutical industry. The latter gets a federally subsidized drug program with no price constraints, while the former is encouraged to develop privatized programs that will compete with Medicare. We've written elsewhere about the influence of pro-life ideology throughout the Bush administration health and human services establishment. Martin Anderson of Stanford University's Hoover Institution warns "The conservatives all want to revolutionize the tax system, frankly because they haven't thought it through.... It means people from zero to $35,000 income pay no tax and anyone over $150,000 is going to get a tax cut. The people in between get a tax increase, unless you cut federal spending. That's not going to happen." The trend of social disintegration, including the slow breakup of the broad middle class, has been under way for several decades--fissures generated by growing inequalities of status and well-being. The right proposes to legitimize and encourage these deep social changes in the name of greater autonomy. Dismantle the common assets of society, give people back their tax money and let everyone fend for himself. Is this the country Americans want for their grandchildren or great-grandchildren? McKinley's conservatism weakened and fell, he notes, not because of socialists but because the country was wracked by social and economic conflict brought about by technological change (then, industrialization), and the consolidation of giant corporations. Although the economic issues were not resolved until the New Deal, the McKinley era gave way to Progressives Teddy Roosevelt and William Howard Taft who instituted worker health and safety regulations, banned corporate campaign contributions, and instituted the progressive income tax. What's needed to respond to the current right-wing assault, Greider asserts, is a new understanding of progressive purpose -- one that is linked to social reality. The goal is the same as the right's: to create greater self-fulfillment. But unlike the right, the progressive seeks to create it as broadly as possible. "Self-reliance and individualism can be made meaningful for all only by first reviving the power of collective action." Editorial. "Dear Mr. President" San Jose Mercury News 2 May 2003.